Cluster Balloon Launch, June 7th 2008: "Chairway to Heaven"
Crew started gathering at the launch site deep in the night. The airfield was completely quiet; it was warm, even though the first rays of dawn were hours distant. 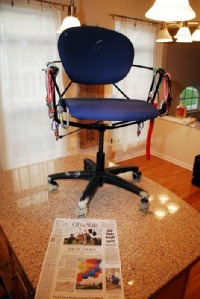 The gondola for this flight was a standard office chair borrowed (and later returned) from my workplace in Raleigh. At 30 pounds, without the parachute, it certainly didn't make the most efficient gondola – but then this was to be a flight of fancy. We had the ability to lift the weight, and carry the contradiction of work and dream aloft. Just three weeks earlier we used this same airfield for the first standard gas flight to launch in the Carolina's in over 20 years. So, we had practice inflating and launching at this exact site, and had made some friends along the way that also came out to help with this cluster. The 55 tanks of helium had been set up into 8 inflation stations – one for each connect point on the gondola. 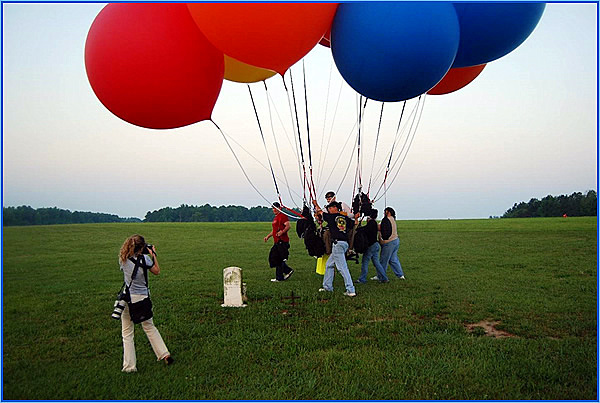 After a demonstration inflation, the crew broke into teams and went about emptying the helium from the boring heavy steel tubes into the glorious light balloons. I was joined by work colleagues, my girlfriend, my mentor (a very experienced gas pilot himself), balloonists, friends, and the curious. As the system started coming together, two reporters and a newspaper photographer arrived and did an outstanding job of capturing the spirit of the launch – and they got every pertinent detail correct in their story the next day. We called the tower at Raleigh-Durham International airport, about 20 miles distant, and spoke with an approach controller. He gave me a discrete code for my transponder and a radio frequency to monitor. We were getting so close. It had taken a year to get here, and we were so close. My ballooning friend launched his hot-air balloon and started radioing down wind directions and speeds every 500 feet: at 1,500 feet, the winds were 32 knots. We heard that and we backed up, further down the airfield. An interesting note: the portion of the launch site we used has three graves in it, dating from the 1820's. Rather ominous meeting point to launch an experimental flight, don't you think? In one photo, my crew is pushing me back for launch, and the graves are in the foreground putting me, literally, on the other side of the grave. Now: Transponder set. Radios ready. One hot air-balloon in the air. One hot air balloon launching alongside me. It's time. 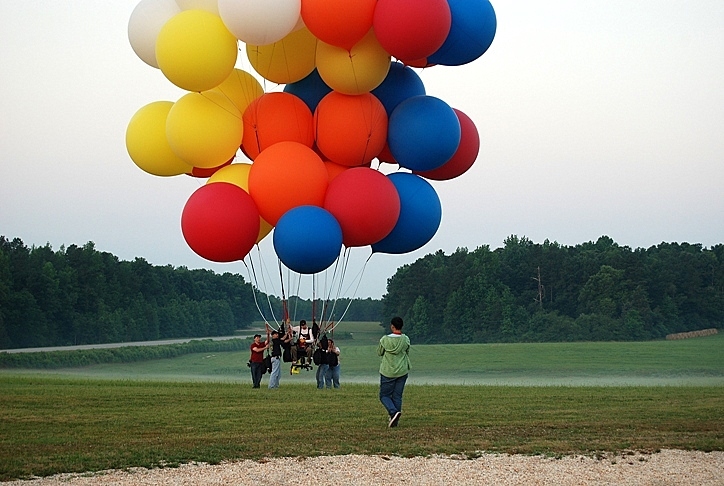 "Early in the morning of June 7th, from an airfield in Franklin County North Carolina, Jonathan Trappe launched his standard, unmodified office chair under a cluster of 55 helium balloons, and took to the skies." The flight took me up well into the ranges where I needed my onboard oxygen system. The air-traffic controllers saw my transponder beacon perfectly, and were able to safely provide aircraft separation services. While flying, I called to them, they spoke to me. Up to over 14,000 feet; I topped out at 14,783. The flight accomplished every quixotic goal of which I had dreamed. Down again, to around 3,500 feet. Then, another climb, back into thin air and the aviator's breathing oxygen. The second air mountain peaked at 13,987 feet. 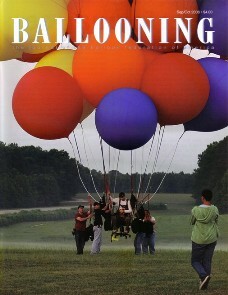 BALLOONING magazine has a feature length story on the flight in the September 2008 issue. I was there that morning, on the airfield, being helped aloft by crew, friends, and loved ones-- I was on the aircraft, and I'm still dreaming of it.